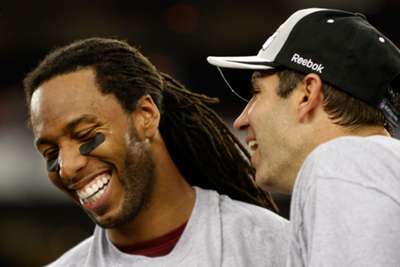 As veteran wide receiver Larry Fitzgerald got ready for Thursday's game against the Denver Broncos, he had some fun with an old team-mate. Former Arizona Cardinals quarterback Kurt Warner was on the sidelines for a pre-game broadcast aired on Fox and NFL Network. During Warner's segment, Fitzgerald came from behind to sack the Hall of Fame play caller. The two played together for five seasons (2005-09) before Warner's retirement. Warner was inducted into the Hall of Fame in 2017.